There are very few pieces of information available about Pietro Giovanni Guarneri, Andrea's son: those given by De Piccolellis in 1885 and 1886 are scarce, Hill released some more pieces of news (1931), those given by Santoro are concise but inaccurate (1989). Pietro was Andrea's son, born in Cremona in 1655; he is supposed to have married Caterina Sussagni on January 29th, 1677. The marriage date was mentioned by De Piccolellis in 1886, but he never alluded either to the church where celebrated or to the certificate. Hill (Hill 1931) and Santoro (Santoro 1991) mentioned only the year. 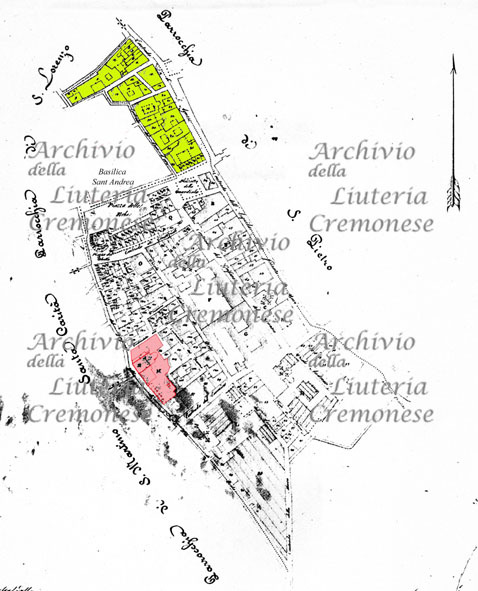 It seems that their first child Andrea Francesco was born in Cremona on January 28th, 1678 and christened in Saint Matthew Church, but the document that De Piccolellis mentioned in 1886, that should have been kept in the parish registers (Battesimi, vol. II, p. 107) is nowhere to be found. De Piccolellis closed Pietro Giovanni Guarneri's biography with the following statement: «He had other children, but since he left Cremona we have no other piece of information about him. However we know that in 1689 he moved back to his father's house for some time, and he stayed there until after his father's death. 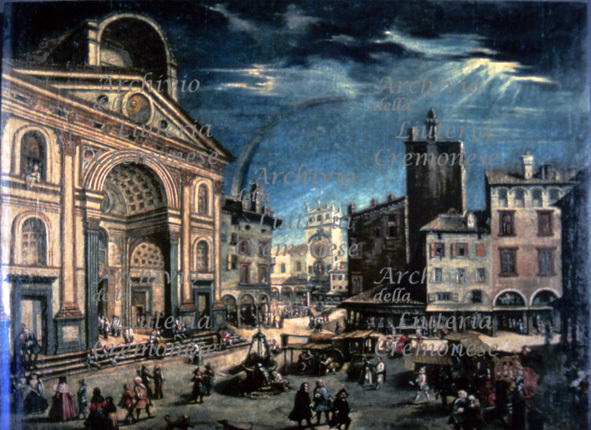 […] He remained in Cremona until August 1698 because on the 22nd day of that month he sponsored his little nephew Bartolommeo's, his brother Giuseppe's last son, christening. There is nothing else to say about him, except that he certainly moved back to Mantua, where he lived a long time, and I think he moved to Venice later, where he died a very old man». Concerning what De Piccolellis stated, Pietro's presence in Cremona in 1698 is confirmed, but there is no evidence of his stay in his hometown until his father's death (on December 7th); as we will see later, one of his daughters was born in Mantua on December 10th. It is important to stress that at the time when De Piccolellis was writing his essay, Pietro of Mantua was erroneously still believed to be the same person as Pietro of Venice, whereas the latter was his nephew, his brother Giuseppe Giovanni Battista's son. Santoro added some pieces of information about Pietro Giovanni's life in Mantua (Santoro 1991). My survey of the archives in Cremona and Mantua, dating from many years ago, confirmed the existence of most of the documents the Hills mentioned and the discovery of some unknown others, pertaining Pietro's many children, the date of his first wife's death and his second wife, provided glimmers of understanding on the this Cremonese luthier's life. The Saint Matthew parish Stati d'Anime confirmed that between 1676 and 1677 Pietro married Caterina Sussagni and they lived in his father's house. The birth of his first child Andrea Francesco, born in January 1678, should have been registered in the Stati d'Anime in that same year or during the following one, but it wasn't; it makes us presume that the child died soon after his birth and he couldn't be his father's apprentice in Mantua, as Santoro stated. It seems that husband and wife live in the family house until 1679 and are not to be found there anymore in 1680. Pietro left Cremona and moved to Mantova probably at that time. A document dated May 7, 1685 found by Stefano Davari (1884-1885) in the ducal archive in Mantua is the first reliable piece of evidence about Pietro Giovanni's presence in town, as he askes the Duke «...essere aggregato per hora al numero degli altri suoi [...] suonatori attuali per suonar egli la Viola e Violino (... to join immediately his other […] present musicians, to play the viola and the violin)». The Duke grants his request and promises him the same salary and treatment as Francesco Scalfoni, when “in time” he will pass away. Therefore, Pietro Giovanni arrived in Mantua as a viola player and violinist, just like Claudio Monteverdi did a hundred years before. On February 22nd 1689, Francesco is born in Mantua. The fact that the second child is given the same name of the firstborn confirms Andrea Francesco's death. Francesco is christened by the parish priest of Saint Lawrence (Pics 1 and 2) in Saint Andrew basilica (pic. 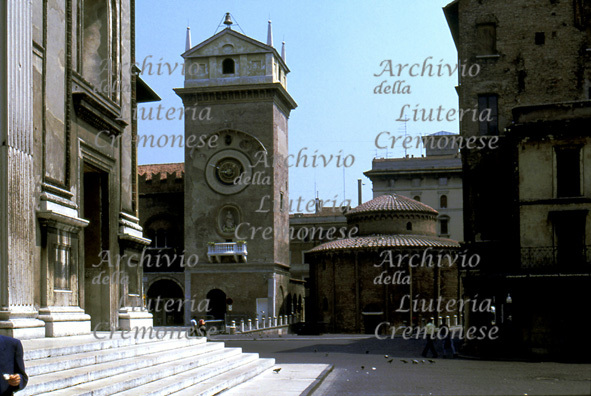 3), where a chapel is expressly devoted to the parish since 1579, when Duke Guglielmo Gonzaga closed the "Rotonda di S. Lorenzo" church (Saint Lawrence Rotunda - pic 4)), original location of the parish. Francesco's christening certificate attests that Pietro and Caterina lived in the Saint Lawrence parish, in the Stati d'Anime of which he will be mentioned again in the years 1700 and 1701, but later he disappears. In April 1690, Caterina gives birth to Vincenza Rosa, whose existence isn't proved by her birth certificate, rather by her death certificate, since after living only six days long, she was buried in Saint Andrew church on April 27th. On the following May 1st, Duke Ferdinando Carlo appointed Pietro his «Maestro de' Violini» (First Violin), and not, as Santore stated (1991), the luthier in charge of the care of the instruments of the court. In 1692 his son Paolo dies at «one year and six months» of age and is buried in Saint Andrew church on December 6th. The year 1693 was tragic for Pietro Giovanni. On August 27th Giacomo Antonio is born and is christened in Saint Andrew the following day but, probably due to post – partum complications, his wife Caterina dies at the age of 34 and is buried in Saint Andrew on September 14th, followed by her newborn, buried in the same church on October 24th. 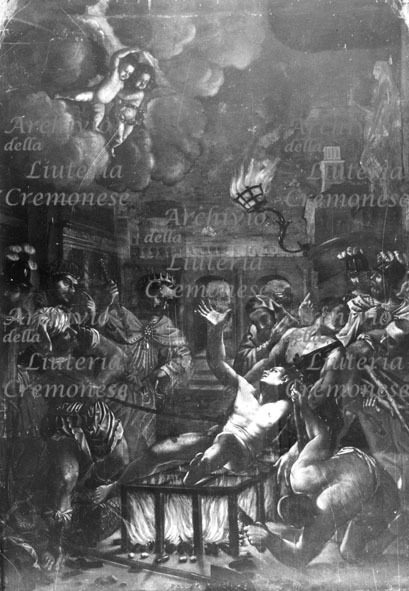 Caterina's death was mentioned by the Hills too (1931), who cited the Stati d'Anime of the year 1694, in which Pietro is reported to be married to Lucia Guidi, Bartolomeo's daughter, born in Guastalla on February 17th, 1667 and married in the cathedral of Mantua on November 25th, 1693. On September 17th 1694, his second wife gives birth to Alessandro Bartolomeo, christened in Saint Andrew church on September 22nd. In the 1695 Stati d'Anime, this woman's surname is reported to be De’ Guadis, but the baptism certificate of another child of Pietro's, Ludovica, who was christened Saint Andrew church the same day of her birth, on November 14th, and died on November 17th, reports that his wife Lucia's last name is De' Borranis. The Hills didn't know about the parish registers, so they made Lucia de’ Guadis coincide with Lucia de' Borranis, but could they be mistaken? I wondered how it could be possible that while in Alessandro Bartolomeo's baptism certificate (in September 1694) and in the parish family books of the year 1695 (in March?) the woman was registered as De' Guadis, in November of the same year she was reported to be called De' Borranis. Lucia de' Guadis might be dead during the writing of the parish registers in 1695 and, concerned about his still very young children's fate, Pietro might have married another woman with the same name right after her death. I looked for either the possible Lucia Guidi's death certificate, or the certificate of a possible Pietro's wedding with Lucia Borrani, but never found either of them. Luckily, the location of the document certifying the payment of Lucia's dowry to Pietro solved the question. Notary Francesco Cattaneo drew up the document on May 4th 1694. The deed was held in Guastalla, in Bartolomeo de Buranis' (alias Guido, obviously Lucia's father) house, located in a street called Contrada dei Padri di San Francesco. Pietro Guarneri took part in the deed as «Lucia de Buranis'» husband, his wife was present too, and the date of the marriage is mentioned: November 25th, 1693. The mistery is solved, Lucia Guidi and Lucia Burani or Borani were the same person. 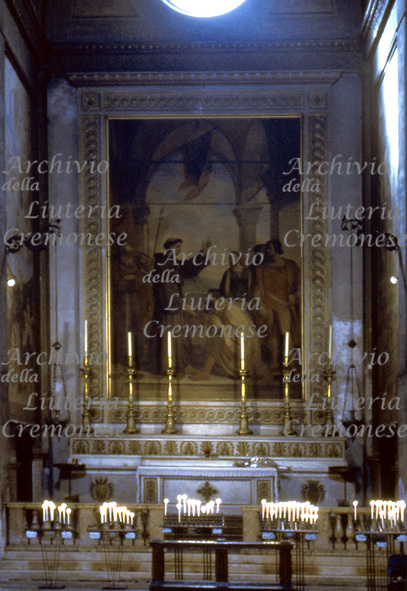 On November 20th 1695, four-year old Alovisio, clearly another one of Pietro's sons from his marriage to Caterina Sussagni, was buried in Saint Andrew. 1707, March 14th, three-month old Vittoria's burial in Saint Andrew. Those are Pietro's children's names registered in the documents of Saint Lawrence parish. The Stati d'Anime of the same parish reveal the existence of other children. On the contrary, Anna Maria was Lucia De' Buranis – Guidi's daughter, registered only in the 1709 Stati d'Anime. The fate of the children whose death certificates are unknown has to be verified, but it is important to notice that among the 21 children (22, if whe consider that the Bonaventura mentioned in Pietro's will isn't the nonsecular name of one the children above mentioned) that his two wives gave him, from 1710 and 1718 only Anna Caterina and Isabella Clara are still living in their father's house with Pietro and his wife Lucia. Eight of their children were surely dead, probably followed by seven more children, and only six children survived. Isabella (Clara), girl of marriageable age (she will marry Andrea Piretti on June 4th, 1720), together with his wife Lucia, inherits all his property and everything else, he wants that his two living daugthers, Isabella and Caterina, inherit in equal parts. On June 20th, 1721 Lucia de’ Borranis, who was widowed at forty-four after Pietro's death, married instead a certain Giuseppe Zanantoni in Guastalla. In conclusion, we can say that in spite of the fact that the prestigious emploiment as court violin player, the exclusive sale of harmonic strings in all the dukedom that the Duke granted him in 1692 (Hill 1931) and the violin making job that he still sporadically practised could have provided him a leisured exisitence, Pietro Giovanni didn't live a happy life.